Any student(s) requesting to ride a school bus must complete the bus registration form. After completing the registration information, the form should be sent via email to agentillybus@auduboncharter.com. Please allow up to 4 business days to receive a route stop and stop time(s) for new registrations. Once your route and stop have been assigned you will receive a letter with your child’s name, route stop, and stop time(s) via email. In our continued effort to improve bus route efficiency, please refer to the most recent updates valid starting this Monday, August 23. Please note that we may continue to update as needed during the next few weeks based on enrollment, until satisfactory AM and PM bus service is fully achieved. Please see lists below for updated schedules from Kid’s 1st Transportation, direct any concerns or comments to Tiffany Peek, Operations Clerk- Gentilly at agentillybus@auduboncharter.comSchedules for stops and times for each bus that have been assigned are listed below by the color magnetic sign that will appear on the side of your child's bus. 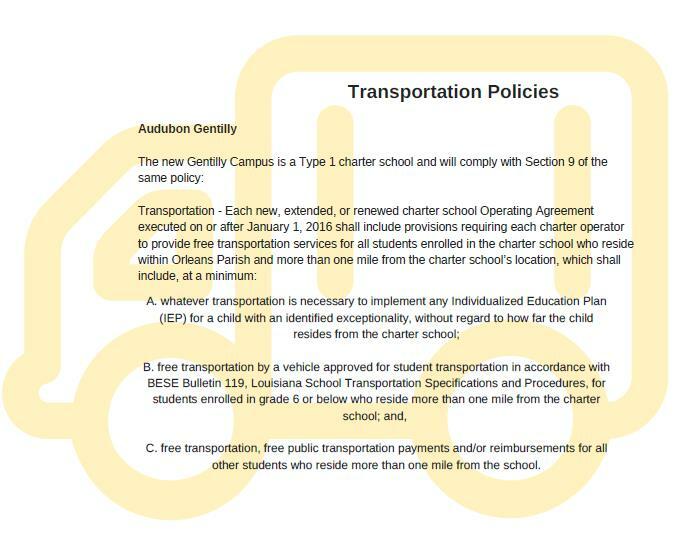 If your child will no longer need bus service and you would like to withdraw, a formal withdrawal form must be completed and sent to agentillybus@auduboncharter.com . Changes will be effective immediately upon receiving the withdrawal form. If there is a change and you need services again a new registration form must be completed and the 4-business day waiting period will apply. Any changes such as carpool, walk-up, or aftercare requests must be sent to agentillybus@auduboncharter.com the day of or before the request no later than 12 noon. Phone requests are NOT an allowed form of notification and against school policy. Please note that if an email is not sent or sent after the cut off, unless the Parent or Guardian picks up before the bus leaves the student will be placed on the bus. If there is no one available to pick up the child at the stop the driver will finish their route and then bring the child back to school where the parent or guardian may pick up at that time.